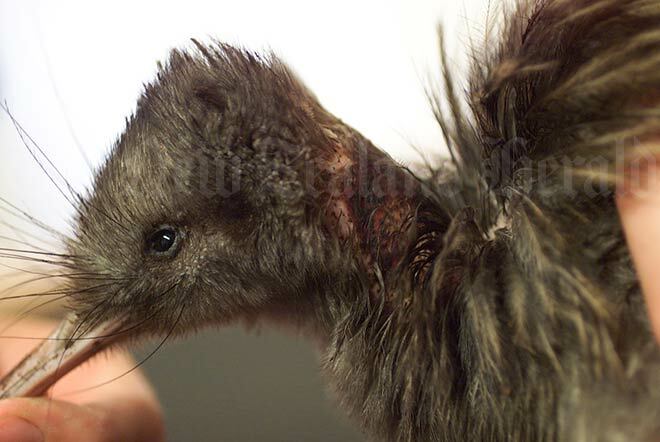 Until they are almost a year old, kiwi chicks are vulnerable to attacks by stoats. This hand-reared chick, nicknamed Honey, was released into the Kaweka Range with a tiny transmitter at four months old. After only two weeks she was attacked by a stoat. She was brought back to Rainbow Springs in Rotorua, and with the help of antibiotics was nursed back to health.